I love growing eggplant. 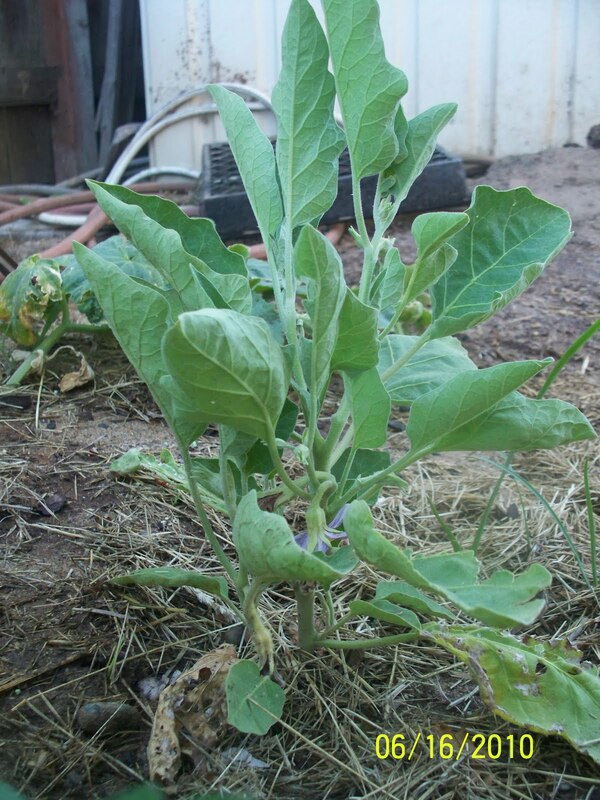 This year I planted two different varieties but my Japanese Eggplant died. All I have left is my White Eggplant. This is the first time I have grown the white variety. This is what the plant looks like today. There is one lonely blossom on the plant. Here is a closer look at the blossom. This is what the blossom will turn into when it is ripe. White eggplants are smaller than their purple counterparts and more tender. They are terrific in salads. I found this delicious recipe for Eggplant Salad. * Vitamin A: 100 I.U. * It also has very few calories and virtually no fat (unless cooked in fat). 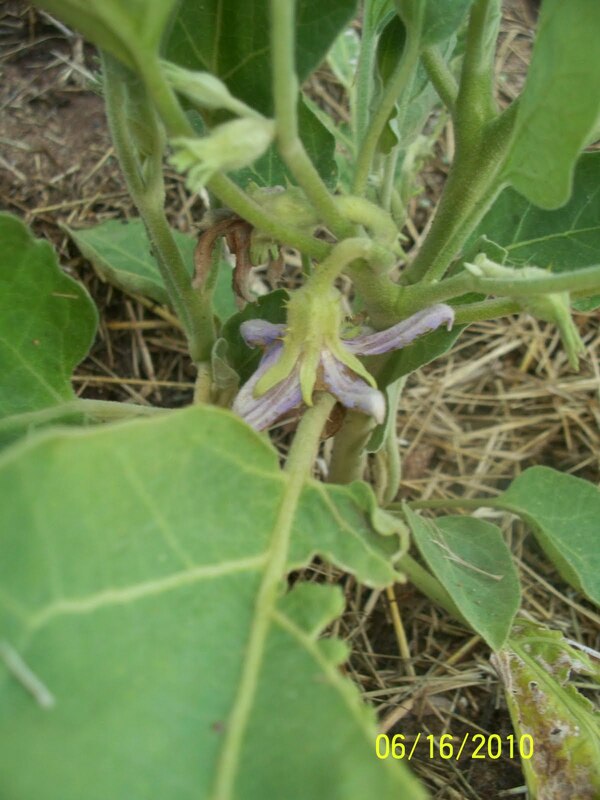 * Eggplant has a high fiber content that helps digestive function, and lowers risk of coronary heart disease. * Eggplants may also help to lower cholesterol levels. * Eggplant skins contain an anthocyanin flavonoid called nasunin which is a potent antioxidant and free-radical scavenger. Nasunin also helps to move excess iron out of the body. PLACE THE EGGPLANT in a shallow heat-proof dish and steam over high heat for about 20 minutes or until tender. Test with a fork. Remove. When cooled, tear into thin strips or cut into a 1/2-inch cubes. In a bowl, cover the optional agar-agar with cold water for 10 seconds or until pliable. Drain, cut into 1-inch lengths and refrigerate. In a small bowl, thoroughly mix together the vinaigrette ingredients. Arrange the agar-agar in a shallow platter. Toss the chilled eggplant with the vinaigrette and scatter over the agar-agar. Garnish with a sprig of coriander and the toasted sesame seeds. Greening the Grill for Dad! I don't think I've heard of white eggplant before. Sounds like a great recipe. I have never tried eggplant before! I might just have to after reading this recipe! Never seen a white eggplant before. I wonder if it tastes the same. Never tried egg plant before however I might give it a try! That sounds delicious. Happy WW. I love eggplant! Haven't tried the white variety though. Eggplant is yummy. We have the Japanese eggplant here and the small round ones. Thanks for stopping by and linking up Cascia. Happy Wordless Wednesday! I have not heard of a white egg plant.. Does it taste the same as the purple one.. I will have to try one if I see it. Wow, I have to tell you that that is the COOLEST plants EVER! I've NEVER seen a white eggplant! Never knew they existed! I have never tried White eggplant, but I love the purple ones! Thanks for the great recipe! I've never even heard of white eggplant before! I've never heard of white eggplant, but it sounds tasty! I don't remember ever having white eggplant before, though I love eggplant parmigiana! I have never seen one before. I've also never tried eggplant in any color!